Is Real Value What the Creator Says or What the Recipient Thinks? Do You Define Value or Does Your Buyer? My client companies work hard to deliver value to their clients and customers. Whatever their offerings, (professional, IP-based services and products to businesses and individuals or a wide range of consumer products) they know that increasing value helps keep those buyers in their fold. This is how they move their Regulars and Enthusiastic Fans up the GO Curve and build Owner Wealth. We speak often about “What is value?” The hard part is whose perception of value counts? Your company could offer outcomes that are ten, twenty or a hundred times the cost to get those outcomes and the buyer can still think “it’s not worth it.” I’ve heard that on more than one occasion in my own practice. It hurts! What is the mission of your company or organization? What is your personal mission? What happens when you achieve the mission? For you? For your customers? For other stakeholders? What happens to your company, your organization or yourself if the road to the mission is unpaved, broken or incomplete? What are your priorities for the next 60-90 days, the coming year and the year after that? What are the dependencies between the near term and the long term? How will you know if you’re making progress to your outcomes? A client company had made a substantial investment in a robust CRM system. I was working with the owner on growing revenue with more customization for long-time customers and in a way that allowed him to take more time away to visit his grandchildren. For more than 20 years he had built his reputation on great service and the personal touch to retain customers. The CRM company rep was urging him to use the features of the system that allowed him to offer discounts and coupons. $25 off here and 15% off there would do absolutely the opposite of growing revenue! But the rep was adamant. To her, these features were value. To the owner and me, the value was in ease of communication, creating affinity groups and crafting customized offers. I finally took her aside and explained that his goal was to increase revenue from long time customers and that the only features he valued from the CRM were those that would help implement our revenue growth plans. In the space of 5 months the company revenue was on track for growth of 33% and he had more time to travel to his grandchildren. Once you have the answers to these questions your company can—must—create offerings that help the buyers achieve what they value. Be clear, be definitive, and be creative. Most of all, know that one size does not fit all! When you get an objection or a hesitation, stop and ask more questions. Are you the least bit suspicious that you and your buyers aren’t talking about value in the same way? Let’s have a Listening Call to discuss what’s going on with your company. 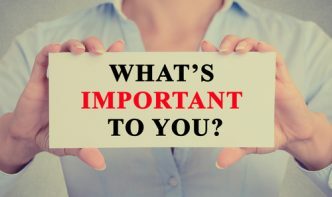 I have no doubt that I could introduce some creative ways for you and your clients to have a meeting of the minds on “What is value?” Call 703-790-1424 or reply to this email to schedule your Listening Call. I look forward to hearing from you. Previous Previous post: Do You Put on Your Lifejacket After You Fall Off the Boat?